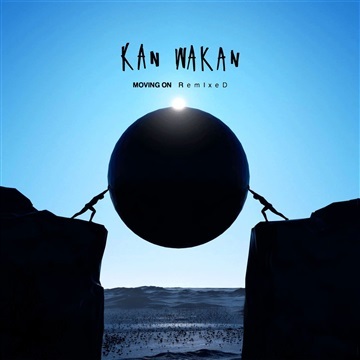 Kan Wakan arrives with a striking breadth of vision that immediately places it among modern pop’s most beguiling and inventive new artists. The Los Angeles-based duo’s (Crooked Waters and Peter Potyondy) extraordinary debut LP Moving On introduced its ornate and enveloping amalgam of moody, hypnotic-soul, post rock, electronica and noir jazz. This remix compilation features those songs, reshaped and rearranged to create something both startlingly original and utterly contemporary. In the spirit of remixing, our longtime collaborator Andre Kostin has "remixed" Storm Studios' original cover art with his distinctive 3D aesthetic.The legendary Storm Studios--which is responsible for many classic and timeless album covers for bands like Pink Floyd and The Mars Volta--journeyed from London to Joshua Tree to shoot the original surreal desert scene with a giant black balloon custom made for the concept by Dan Abbott. The FREE compilation will feature remixes of our songs by some of our favorite producers, plus never before released demo material.